Olinda, Victoria – Australia. Cloudehill Gardens Photographed by ©Karen Robinson – Feb 2017. Here in this photograph, I (Karen) was setting up my EOS 1100D Canon DSLR camera on a tripod and photographing the lower meadow of Cloudehill where bulb flowers are in bloom. It was such a pretty location. Featured in the background is my daughter and son-in-law. My husband took this photo of me with my Samsung Galaxy S6 mobile phone. NB: All images are protected by copyright laws. Another photography adventure! With my husband, and this time joined by our daughter and son-in-law, it involved visiting the glorious Cloudehill Gardens. We drove through the highly scenic Dandenongs to reach our destination. 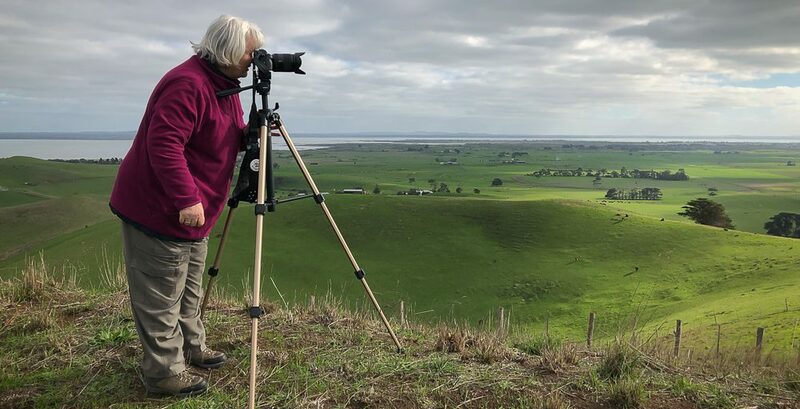 It was hard not to want to just stop every few minutes to photograph this beautiful region of Victoria – Australia. During this garden photography exercise – I used my EOS 1100D Canon DSLR camera on a tripod with a remote timer for the big shots. I also used my Samsung Galaxy S6 Mobile Phone for quick spontaneous photographs. 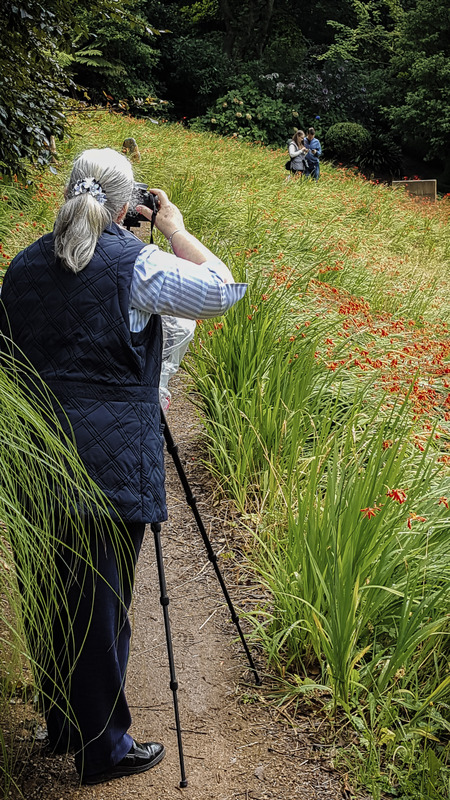 The aim of this photography adventure was to gain some experience taking garden photographs during a time of day not ideal – being late morning and over mid-day. I found it particularly difficult to work out how to shoot sky and garden together without over exposing the sky. Although shady spots proved to be interesting – as filtered light offered soft lighting photographic opportunities. Olinda, Victoria – Australia. Cloudehill Gardens Photographed by ©Karen Robinson – Feb 2017. As I (Karen) was setting up to take this photograph the lighting changed a few times as the clouds covered and uncovered the sun. At one point the clouds uncovered the sun allowing for it to filter through the over arching tree branches and leaves. 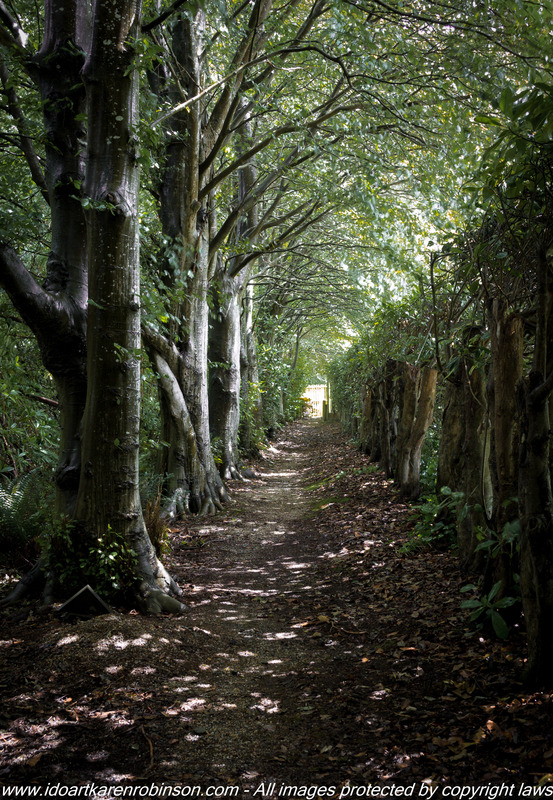 The dappled lighting was just beautiful which help create this wonderful natural tunneling effect. The location for this particular photograph was just behind the Marquee Lawn area. The trees run alongside of Woolrich Road section of the gardens. NB: All images are protected by copyright. 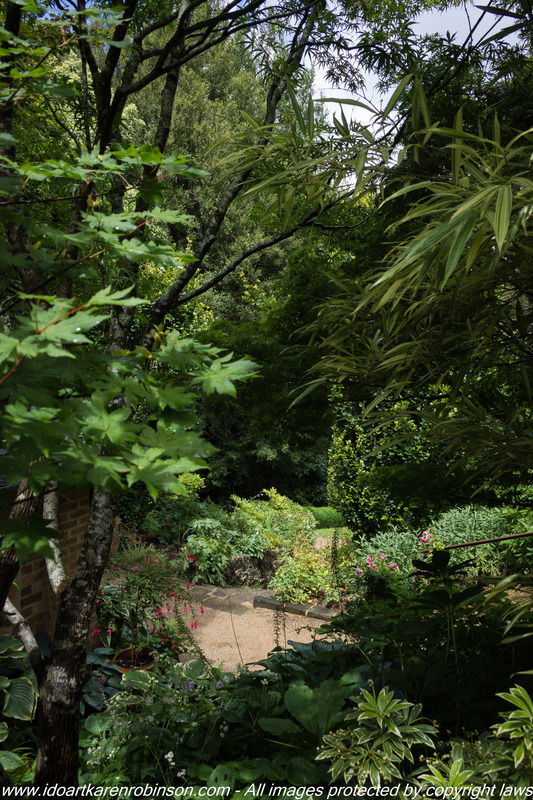 “Cloudehill Gardens is located at the top of the Dandenongs, has an altitude of 580 metres with deep volcanic loam soil and 1.25 metres of rainfall which falls throughout most of the year with February, March and April being drier. Sometimes there is a little frost and snow (Cloudehill 2017). Not many have the chance to make a garden out of an old flower farm. 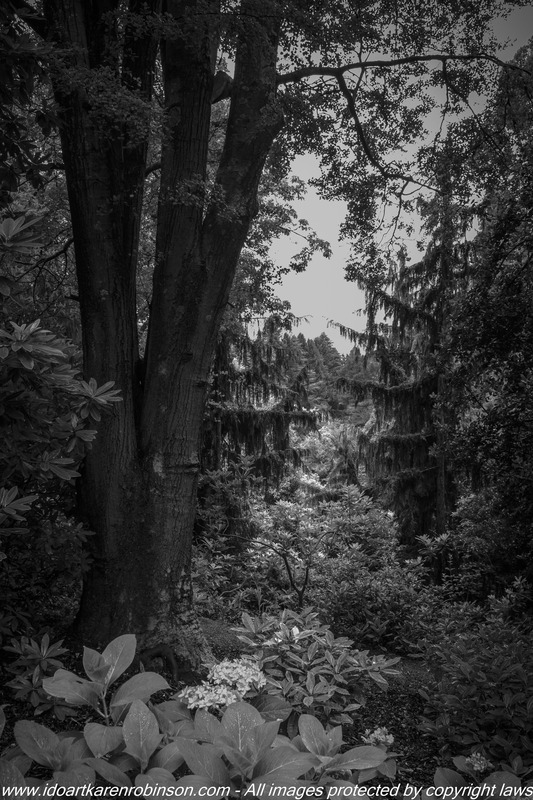 Cloudehill’s original planting goes back to Jim Woolrich when he began planting shrubs and trees and bulbs for the cut flower market and florist trade in the ’20s. The flower farm thrived through to the ‘6os then, after 20 years gently resting, Jeremy Francis bought what was now something of a sleeping beauty’s garden and began making Cloudehill in 1992. Cloudehill’s design derives from Italian renaissance gardens, English arts and crafts gardens, and from contemporary meadow gardening. Compartments threaded along axes incorporate themes such as ‘expectation and surprise’. Deep volcanic soil and moist mild weather allow plants to achieve majestic proportions; for example, the two weeping maples at the heart of the garden. These glorious trees are historic, they came from Japan in 1928″ (Cloudehill 2017). On my return home, I downloaded all the photographs into Adobe Lightroom 6. I developed a small selection of photographs. It was once more a new experience, especially developing the garden photographs where some of the skyline was over exposed. A number of the photographs I decided to crop the sky out of the photograph itself. I also decided to turn one into a black and white photograph in order to gain the best raw photographic details using Lightroom 6. Overall though I was happy with my efforts and feel that the essence of a beautiful garden was captured. Please find both above and below the best of what I took on the day. Olinda, Victoria – Australia. Cloudehill Gardens Photographed by ©Karen Robinson – Feb 2017. 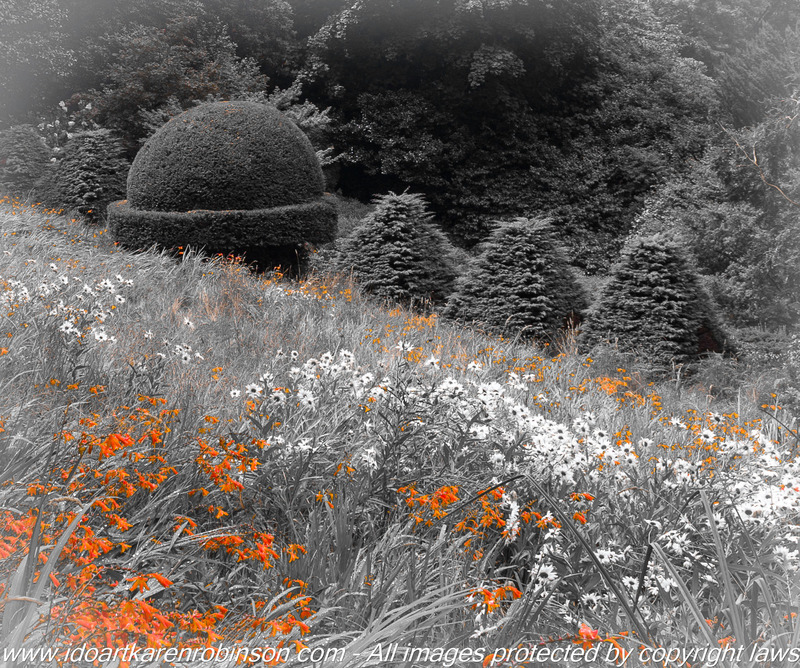 During the processing of these photographs I (Karen) decided to experiment with a black and white look but keeping the colour of the flowers prominent within the image. To soften the overall look I also added some post-crop vignette which I think works well. NB: All images are protected by copyright laws. Olinda, Victoria – Australia. Cloudehill Gardens Photographed by ©Karen Robinson – Feb 2017. The Beech Walk (R) was just so beautiful. 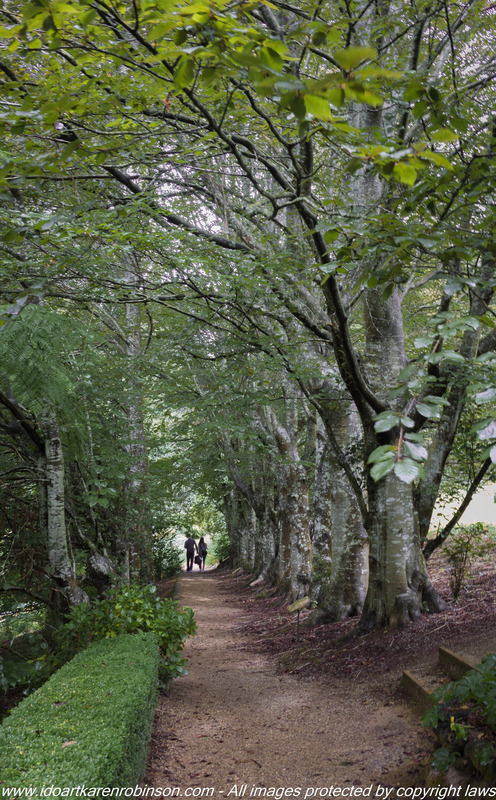 Looking through this tree-lined pathway down towards my daughter and her husband who had strolled ahead of us, just seemed to be the perfect photo. The dappled light that manage to creep through the over arching trees made this photograph seem intimate and personal I feel. NB: All images are protected by copyright laws. Olinda, Victoria – Australia. Cloudehill Gardens Photographed by ©Karen Robinson – Feb 2017. This is my favourite photograph of the day that I took! It is located just near the Summer House (H). The lighting and leaf foliage is just beautiful and I think because I was standing up on a pathway that looked down over this area, just gave the photograph a more interesting perspective. NB: All images are protected by copyright laws. This entry was posted in Photography and tagged Adobe Lightroom 6, Cloudehill Gardens, Cloudehill Gardens Olinda, Colourful Flowers, Dandenongs, EOS 1100D Canon DSLR Camera, Garden Arches, Garden Paths, Garden Photography, idoartkarenrobinson, Karen Robinson, Photo Journalling, Photography, Samsung Galaxy S6 Mobile Phone by idoartkarenrobinson. Bookmark the permalink.